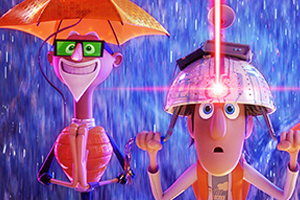 Check out Cloudy with a Chance of Meatballs 2 on Blu-ray 3D, Blu-ray and DVD! We’re always telling you about the coolest DVD releases on Fun Kids and if you love comedies then you might want to check out Cloudy with a Chance of Meatballs 2! Flint Lockwood has returned for another food-based science adventure. After thinking he saved the world by destroying his invention that made it rain cheeseburgers and meatballs, it turns out he was wrong. The invention survived and is now creating food-animal combos known as Foodimals! Once these foodimals are discovered Flint and his friends set off on a mission to battle hungry Tacodiles, Hippotatomuses, Shrimpanzees and loads more – all to save the world. The film is out on Blu-ray 3D™, Blu-ray™ and DVD right now and features loads of extra bits that you didn’t get at the cinema! Some of the extras include Cody Simpson’s Laa Dee Da music video and featurettes such as the Anatomy of a Foodimal. Want to check out Cloudy with a Chance of Meatballs 2? Click here to order now! Parents: Click here to check out the Cloudy with a Chance of Meatballs 2 Facebook page! © 2013 Sony Pictures Animation Inc. All Rights Reserved. Playing: hard place by h.e.r. beano is the best book.